Wow, it was a year ago (minus one day) that I debuted the idea of refashioning this gigantic mohair sweater. What a hideous garment! This thing sat around all summer, and through the fall, and in the end, it was a few hours of work. Now it's a relatively sleek cowl/turtle neck, courtesy of Burda Magazine. I used pattern #104 from the September, 2012 issue. It's one of those sleeper patterns. A great basic that's hidden behind other less interesting garments. Like this jumper. There was tons of room for the body pieces. But it is a lucky thing that my arms are short. 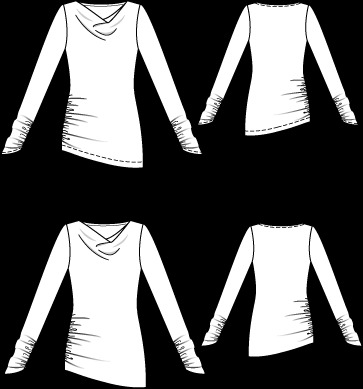 The pattern has much higher sleeve caps than the original, dropped shoulder, design. I used the stockinette face of the knitted fabric. This had been the wrong side of the original sweater. Part of the long delay in getting this project done was caused by my worrying about the original hems which sported a few rows of 2x2 rib, then a stockinette section that rolled to the outside. Switching faces meant that this section would be reverse stockinette that would roll to the inside. Now I'm wondering why I thought this wouldn't look just fine. For the turtleneck collar, I used the width of the original front hem, which was about the height of the collar Burda called for. It rolls to the inside too. Doesn't bother me in the slightest. I constructed the entire thing on my serger. The fabric is ethereal. It was switching my serger back and forth from serge to coverstitch that did it. Remember, the swimsuit? I broke down and bought a dedicated coverstitch. It's the Janome 1000CPX. Does one thing with three variations, and does it well. Of course I had to try it out right away. Of course, I didn't pick an "easy" project. I made a fleece yoga top from the November, 2007 issue of Burda Magazine. It's simple enough to put together. Front, back and straps. But the fun part was adding a jersey fabric binding at all edges. It's the technique I wrote about here. I had to do quite a lot of practice strips to get the hang of coverstitching through 2 layers of fleece and 3 layers of jersey. The needles were not consistently picking up the lower looper thread. This is a problem because a coverstitch is an elaborate chain stitch, and any open loop means the whole shebang can pull out. Experimentation revealed that it is important to use heavier needles and pay attention to the tension settings for heavier fabric. Also, using woolly nylon thread in the lower looper produced more consistent results. Anyway, this is my first effort. Don't look too close. 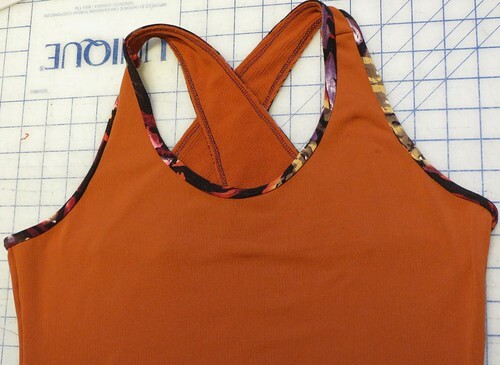 I used scraps leftover from this top for the binding. Then I made another, using fleece scraps leftover from the jacket blogged here for the body, and jersey scraps leftover from the faux-wrap dress blogged here for the binding. It's very cozy. And I did a better job. But I'm not showing you the hem. It's not up to my usual standards. They'll be nice and cozy as an under-layer for curling and skiing ... that is, if we ever get any snow. Way, way back in the mists of time I showed you a gigantic mohair sweater, purchased with refashioning in mind. It got put away over the summer. In September, Burda published this cowl neck sweater/top in its magazine. Hmmmm, I thought. Maybe. But what a completely unhelpful picture. What would that neckline look like if not completely distorted by a pair of sunglasses? What's with all that probably clean, lustrous and lovely but so difficult-to-see-through HAIR? Of course, there is a line drawing, which is a bit easier to read. It looked OK. So I made a muslin from some rayon knit. The kind that will self-destruct in a short while, but I love the print and the colours. Tracing the pattern revealed that the top is too long for a top and not long enough to be a dress. I took a lot - 18cm (7") - off the bottom right away, and another 2.5cm in "hemming" (i.e. I neatened the raw edge) and it's quite long enough. The sleeves are, quite simply, ridiculous. I confirmed via wearing another Burda pattern (this funnel-necked top) that I really don't like sleeves that flop over my hands, even if they are sort of controlled through application of elastic at the seam. So right off the bat, I took another 18cm of length off. Burda says that the sleeves are intended to be approximately 5cm (2") longer than usual. Really? My arms are short, but not THAT short! I am clearly not on the same "fashion" wavelength as Burda, or the hordes of people who think that sleeves are the right length if they cover the knuckles. The shoulders are too broad for me (I traced the 36). I think the quick fix for next time is to take about 1.5cm out at the CF and CB. 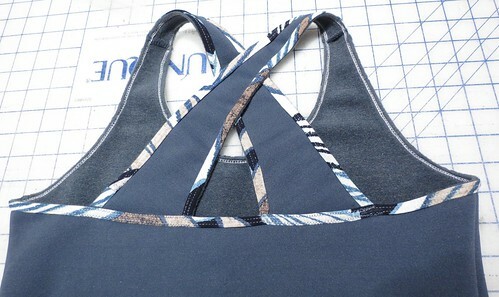 The quick fix in sewing was to add elastic at the back neck. The neckline is too wide. (Oh yeah, that white thing showing at the model's left shoulder? It's underwear of some kind. Not for me, thanks.) The same quick fix as above might take care of this too, for next time. You can see both of these issues illustrated in the photo at right. The edge of the paper is the CB as cut. Elastic threaded through the neck facing (a strip cut on the lengthwise grain of the knit) has cinched it in to the line, which is the CB for next time. The sleeves are sloppy wide though they were the right circ. at the hem. I straightened the seam line. There is a smidge too much length through the armscye. So what do you think? Should there be a next time? Yup, The Sewing Lawyer has a new swimsuit, just in time for next week's two swim practices. I'm very pleased with it - it's functional, feels comfortably long enough, and is snug without being too tight in any direction. The fit and style are very similar to expensive RTW suits (i.e. Speedo, Tyr brands) except that those would have more contrast trim. 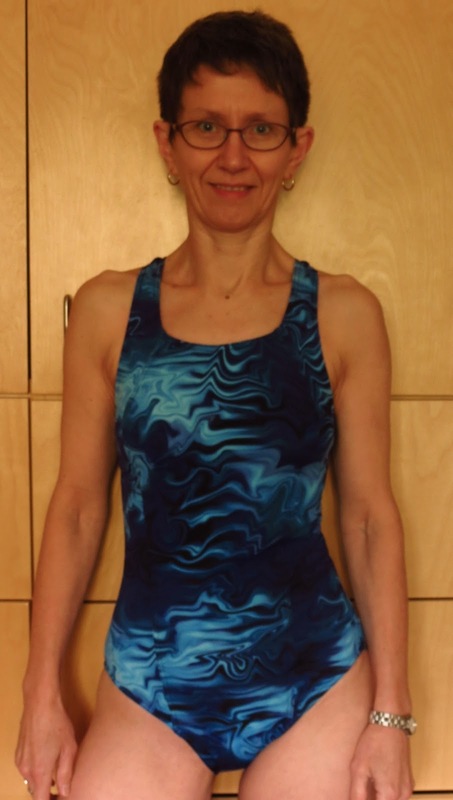 Of course, I could have jazzed my suit up as per the pattern but I didn't have any plain black or navy in 100% polyester in my stash, and refuse to consider a swimsuit with any lycra because they disintegrate far too fast. While it's not particularly fancy, I expect this suit to be functional. At 6AM it's only important that it covers what it needs to cover, and doesn't bind or shift. After the adjustments I made to the pattern (detailed here), I proceeded cautiously because I figured that after adding the lining fabric to the front pieces the body would be less stretchy and after adding the elastic, the length would be less stretchy. So I basted it together at least 3 times while in progress. The elastic makes a huge difference to the security of the suit. For next time, I'm going to try to remember that if the unelasticized suit feels sloppy and too long, it'll be just fine once an appropriate amount of elastic is applied. I'm not 100% taken with the angle of the leg opening at front, but the back coverage is perfect with the width I added. My only complaint is that switching my serger from 4-thread safety stitch to coverstitch is a pain, and I had to do it about a million times.